You’ll find surprisingly little information online about the band, Under Fire. On the one hand that is surprising, given the band was assembled by Cary Sharif, Billy Squier’s guitarist on his breakout album, Don’t Say No, plus Jimmy Waldo, keyboard man with New England, Quiet Riot and Alcatrazz. On the other, their sole album (1989) was released on a tiny US label, got no promotion and they didn’t tour. Eighties’ Melodic Rock had cast a giant shadow. 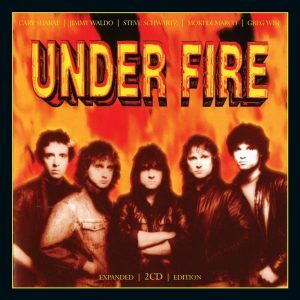 Some bands broke out into the light, and others, like Under Fire, lacked the originality to get out from under. Too much of their one and only album is filled with lumbering, anticlimactic material. ‘Rolling Down That Road’ searches for a comfortable groove, but lacks a decent tune. ‘Heart In Pain’ has a taut, streamlined verse and bridge but is let down by an underwritten chorus, and ‘Love You One More Time’ lacks identity – you could never have picked it out of a lineup. Given the year of release, it’s no surprise that it’s the album’s AOR anthems that glow the brightest here. Specifically, it’s the booming, keyboard driven arena rock of ‘No More Heartaches’, ‘Crazy For Love’ and ‘Hold Out’, propelled by Moki Demarco’s gale force vocals, that push your heart to beat that little bit faster. Yes, they’re lyrically limited, and yes they’re derivative – echoes of The Who, Blue Tears, Autograph and others ring out through this declamatory stadium rock – but they strike a chord. Well used and worn down perhaps, but one that resonates, none the less. Waldo and Sharif had auditioned many vocalists before choosing DeMarco, and he was something of a find. His vocal similarity to Clyde (Biloxi) Holly on these tracks is astounding. This remaster (by New England’s Hirsh Gardner) brings up the keyboards and bass, and dampens down the guitars, particularly giving the anthemic stuff more oomph. A second disc, of bonus tracks, is intriguing . . . if this is the stuff that missed the cut, then . . .but, there are two tracks – from the eight – that feature Waldo’s pal from Quiet Riot, Paul Shortino. And these are something. Shortino’s raucous, barrel chested rasp adds real character to these two Survivor imitations. Why Shortino? Who knows, maybe these were recorded before DiMarco came on board. This 2 CD remaster comes with new liner notes from Malcolm Dome, based on an interview with Jimmy Waldo. Dome has created an appealing pen portrait of Waldo, focusing on the man’s humanity, rather than his life as a musician. A welcome change from liner note hagiography.